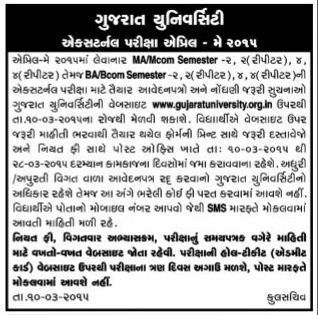 Gujarat University has published MA/Mcom Semexter 2, 4 (Repeter) and BA/Bcom Semester 2, 4 (Repeter) Exam Notification. Candidates can download application form through www.ghujaratuniversity.org.in form 10-03-2015 to 28-03-2015. I want to know external MCOM sem 1 date of applications form.